collectSPACE - news - "Hanks' adds space to Mickey's 75th"
November 19, 2003 -- The Walt Disney Company is honoring Mickey Mouse's 75th Anniversary by kicking off 18 months of celebration beginning at Walt Disney World Resort with the unveiling of 75 uniquely designed, 700 pound, 6 foot tall Mickey statues -- a tribute to Mickey from an impressive group of friends. The statue program, appropriately deemed "Celebrate Mickey: 75 InspEARations," brings together Disney legends, as well as artists, actors, athletes, performing artists and painters who lent their creative talent or simply creative inspiration to the program that culminated in 75 original statues of Mickey. 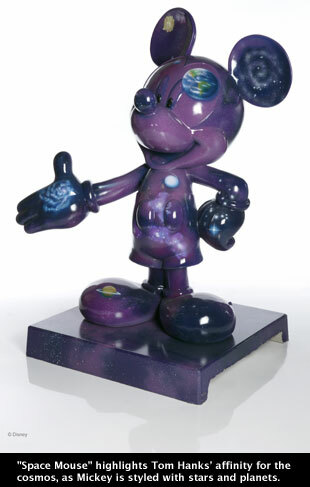 Among the statues' designers was Tom Hanks ("Apollo 13", "From The Earth To The Moon"), whose "Space Mouse" highlights his affinity for the cosmos, as Mickey is styled with all the stars and planets in the galaxy. TivoliToo, a Minnesota-based design and sculpting studio, transformed Hanks' design into the finished Mickey statue. TivoliToo also molded and sculpted each of the polyurethane statues. "It's a true testament to Walt that he was able to create Mickey Mouse with such depth and personality that, on his 75th Anniversary, Mickey continues to take us on adventures, make us laugh and inspire us," said Michael Eisner, chairman and CEO of The Walt Disney Company. "Mickey's relevance can even be seen in the diverse array of people who are participating in this statue program -- some have been working with Mickey for years and others are just true fans." The statues will remain at Walt Disney World's Magic Kingdom through April 2004. From there, the statues are presently scheduled to visit Philadelphia, Boston, Atlanta, Minneapolis, Chicago, Denver, Kansas City, Houston, Dallas, Portland, Disneyland, Washington D.C. and New York City. In 2005, Sotheby's Auction House will auction off the statues for charity. All proceeds from the auction will go to the charity chosen by each artist. Proceed from the sale of Hanks' statue will benefit the James Birrell Neuroblastoma Research Fund. Other notable individuals contributing statue designs include Jamie Lee Curtis ("The Original Mouse Pad"), John Travolta ("Jet Setter"), Janet Jackson ("Mickey's Nation 1928"), and Tony Hawk ("Mouseskateer"). The Walt Disney Company was able to bring "Celebrate Mickey: 75 InspEARations" to fruition with the help of The Coca-Cola Company, the primary tour sponsor. In addition, The Home Depot® provided the Disney Color by Behr paint and all the supplies to bring the statues to life. Suddath Relocation Systems will transport the statues to each destination. Kodak will use its EasyShare system to offer digital photographs of tour guests with the statues in each city involved with the tour.